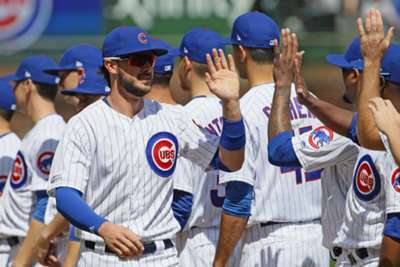 The Chicago Cubs enjoyed their home comforts after crushing the Pittsburgh Pirates 10-0 in MLB action on Monday. After a forgettable 2-7 start to the season, the Cubs finally played at Wrigley Field and silenced the Pirates. Starting pitcher Jon Lester hit an RBI double to start things off in the second inning, and before the frame had ended, Chicago held a commanding 6-0 lead. Ben Zobrist, Anthony Rizzo and Javier Baez all added to the total. The Cubs added two runs in both the third and fourth innings with a two-run homer off the bat of Kyle Schwarber capping off their run total. However, Lester made an early exit in the top of the third inning due to left hamstring tightness. The Cubs went on to win even without their starting pitcher/slugger. Brad Brach earned the win after pitching two innings, allowing just one hit while striking out three. The Seattle Mariners still have the best record in baseball and against the Kansas City Royals, Edwin Encarnacion was their best player in a 13-5 win. The designated hitter hit two home runs in Seattle's eight-run sixth inning. He accomplished the remarkable feat once before in his career during the 2013 season with the Toronto Blue Jays. Encarnacion joins Andre Dawson, Willie McCovey, Alex Rodriguez and Jeff King as the only players in history to do it twice. Blake Snell struck out 11 in the Tampa Bay Rays' 5-1 triumph against the Chicago White Sox and after six innings toeing the rubber, he earned the win. Snell allowed six hits as he moved to 2-1 for the season. Baltimore Orioles' Chris Davis extended his forgettable streak. The slugger went 0-for-five at the plate and now has 49 consecutive at-bats without a hit. Davis broke Eugenio Velez's previous record of 46 consecutive hitless at-bats for the longest hitless streak by a position player in history in the team's 12-4 victory against the Oakland Athletics. Not so fast, Christian Yelich. Mike Trout robbed the Milwaukee Brewers star of a home run in the Los Angeles Angels' 5-2 win. Cedric Mullins was not going to stop at third, literally. The Orioles outfielder hit a triple but ended up rounding third base after the throw from first trickled to the dugout. St Louis were able to take one game from Los Angeles in Monday's meeting to move to .500 for the season. The Dodgers will go with Ross Stripling on the mound against Dakota Hudson.